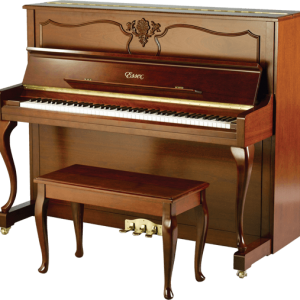 The Boston piano features a duplex scale, adapted from the famous Steinway & Sons design, which adds a harmonic richness that simply can't be duplicated by other instruments in a similar price range. In comparison to other pianos, the Boston has less string tension. This reduced string tension allows for a larger, tapered soundboard, creating longer sustain, and more singing quality in the tone (as well as longer piano life). A wealth of other engineering enhancements, including optimal placement of ribs, braces, and bridges, also contribute to the Boston's superior tone and greater stability. 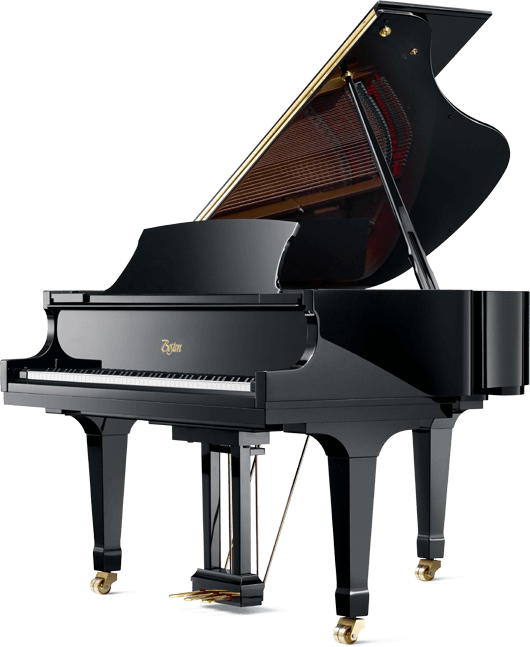 The Boston grand piano offers a larger soundboard in comparison to other pianos of the same length, due to its innovative “wide tail” design. 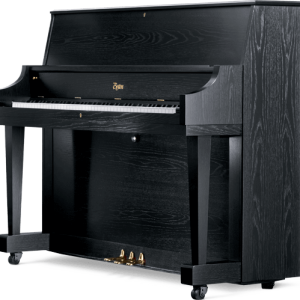 This wider construction of the case means that a 5' 10″ Boston grand has the same soundboard area as a typical 6' 2″ grand piano, creating the power, richness, and feel of playing a much larger piano. Each Boston piano soundboard is crafted of Sitka spruce, long proven to be the most resonant material available. Boston soundboards are also precisely tapered, which allows them to vibrate more freely. In conjunction with a number of special technologies — unique patents of Steinway & Sons — the result is a powerful, sustained tone. Fine veneers underlie the elegance of the Boston pianos — available in walnut and mahogany satin or polished finishes, as an alternative to the classic ebonized — all designed to delight the eye and enhance the player's experience. Ebonized or white finishes over an outer substrate of phenolic resin. Natural finishes over veneers of American Walnut and African Mahogany. Laminated hard rock maple (Acer Saccharum) inner rim. Laminated Philippine mahogany outer rim. Continuous bent rim. 11 outer rim laminations, 17 inner rim laminations. 23mm (7/8") outer rim width, 38mm (1 ½") inner rim width. Radiating braces of laminated Philippine mahogany provide stronger triangular support than parallel designs. This rigid support increases tuning stability, soundboard, crown retention, and longer piano life. 3 braces. Treble: Vertically laminated (alternating mahogany and maple) with a solid maple cap, curved to fit the crown of the soundboard. Bass: Solid maple mounted to cantilevered base. Doweled, glued, and screwed to soundboard. One continuous base and treble bridge. Overstrung: combination agraffe; with front and rear duplex. Lower tension scale for longer sustaining tone and longer life of the whole piano. 17,251 kg (38,032 lb) tension. Premium wool topfelt over premium wool underfelt. Weight of topfelt: 9.5 kg (20.9 lb). Compression-wired to retain permanent shape. Mahogany moldings. Tapered hammer-shanks from select resilient maple or horn-beam. Computer-designed pear-shaped hammers with reinforced shoulders result in superior tone, increased durability and greater voicing ability. Solid maple (all wood, no plastic) for all moving parts. Steinway profile-shaped flanges, extruded aluminum action rails for increased stability and less frequent regulation. Steinway action geometry provides superior touch. Made from laminated hardwood faced with spruce. Strong, rugged construction provides a solid mount for the keyframe and action allowing for precise and prolonged action regulation. Large maple dowel ends provide a solid mount for adjustable brass touch-regulating glides. Keybed thickness is 42 mm. Music desk positions: 4 Fallboard: Soft fall fallboard Casters: Heavy-duty double-wheel solid brass casters. Locks: Fallboard and top locks. PropSticks: Double top prop sticks. Estimated $431.94/month for only 6 years! Apply Now! 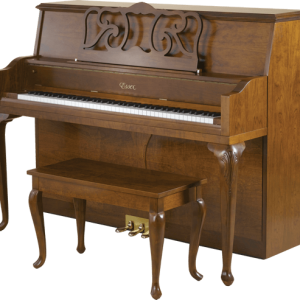 This 5' 10″ (178cm) grand piano is the perfect addition to any teaching studio or music room.